“A women’s work is never done” so goes an old saying. In these days there is the phrase ‘Working mothers’ meaning those who go out to work. In farming probably more than any other occupation these sayings have real meaning and significance. Beside the normal domestic duties of any home – meals, washing, ironing, cleaning, shopping, the school run etc. wives and mothers on farms may have many other roles to fulfil – secretary, book keeper, form filling, answering the phone, dealing with visitors, feeding stock or helping in other ways, running a B&B, being a listening ear and support to husband or son. Not forgetting some who are farmers in their own right. Unlike many other occupations you are always on site, ‘on the job’ 24 hours a day. Add to this the many pressures in farming in recent years through disease, red tape, financial difficulties, and the questions come – Is there no hope? What is there to look forward to? Is there an answer? One farmer’s wife with 40 years farming behind her said this. “I believe there is an answer, though not perhaps in the way we first think. There is a hope and a future for each of us, and for me it lies in the fact that I came to know God as my Father, and can take every problem to Him in prayer, that has made all the difference. History and the Bible tell us that the Lord Jesus Christ lived in Palestine 2000 years ago. He died on a cruel cross, but rose again and ever lives to be our Saviour. He is the one who lifts you out of the slough of despond, the darkest depression, and sets your feet on a rock. He is alive and He is real. He is only a prayer away. He is my Saviour and wants to be yours too. Through our Women's Circle we share precious thoughts and experiences of Him. 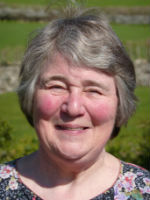 Our Christian Friend Magazine is produced quarterly by Dorothy Dobson who lives on a farm in Cumbria now run by her son. One reader writes: "I felt I must write and thank you for sending the Christian Friend which I enjoy. The Spring one was most helpful"
God bless you, and may you find that peace of God that passes all understanding.